Nokia N86 8MP - wonderful birthday gift from hubby. Well, just I am trying to cope up with it, hubby told me that I should not keep on getting sentimental over some damage objects. Maybe, you'll get lucky and you'll win something, he said. My answer was a short, " I do hope so." I am so happy and yes, you might be thinking, I'm jumping with joy when i received this cellphone, simply for two reasons. 1. I have never owned a brand new cellphone in my life (just until now). My old cellphones were all hand me down, coming from him or coming from a close relative. 2. I am so thankful because I have a cellphone and a high pixel camera at the same time. So, I don't think there is a need for me to buy another digital camera. Just to share with you some specifications of my new Nokia N86. From what I've learned from the internet, Nokia N86 offers more subtle but meaningful improves over the Nokia N85 (by the way, they look similar except for the second slide) and it surpassed the Nokia N95. This phone packs all my favorite features , 8 MP camera, stereo music and just as they say, one of the best cell phone cameras on the market today. Well, even better that the Sony Ericksson C905 who happens to be 8MP too. I'm so impressed with its OLED screen, though i could not tell much because it's my first time to have one like this but i am really loving it. You may've thought Nokia lost their touch, you may be out of love with the Nseries but the Nseries are always keeping an eye on you. Their wide-angle, variable aperture eye. On you. Whether the Nokia Nseries are making up the ground lost in the megapixel race or claiming back what they believe is rightfully theirs, they seem to have the right leadership to put them back on the megapixel map. 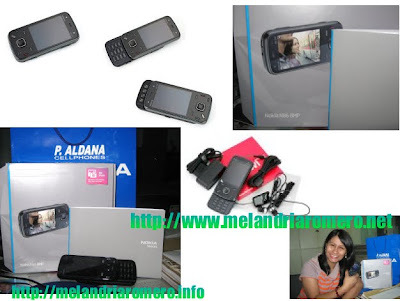 The Nokia N86 8MP is quite an accomplished smartphone with rich equipment. Perhaps the only disappointment is the screen - we couldn't help a sigh over the now aging Nokia N95 8GB 2.8-inch screen, not to mention that QVGA resolution hardly cuts it anymore. Armed with one of the most advanced cameras in terms of hardware and features you don't just find on every other handset out there, the N86 8MP is keen to take cue from the N85 and shake the Nseries out of their slumber. Now, in case you forgot, it's still the market leader we're talking about here, and that should probably tell why everybody is so worked up. So, the question as always is whether strong performance will deliver on that awesome promise. And you've got us to help you make a more informed decision about buying Nokia N86 8MP. Given all the comments above, the N86 8MP is more the kind to encourage impulsive spending but you'll choose wisely not to miss our write-up. Camera-wise however, the N86 8MP seems to reduce the distance to point-and-shoot digicams quite successfully. Its camera performance is yet to stand trial by fire but the specs look impressive. Whoa, that is great present! btw, i've got something for you here.